The Church calls Saint Constantine (306-337) “the Equal of the Apostles,” and historians call him “the Great.” He was the son o the Caesar Constantius Chlorus (305-306), who governed the lands of Gaul and Britain. His mother was Saint Helen, a Christian of humble birth. Constantine, the future ruler of all the whole Roman Empire, was raised to respect Christianity. His father did not persecute Christians in the lands he governed. This was at a time when Christians were persecuted throughout the Roman Empire by the emperors Diocletian (284-305) and his corulers Maximian Galerius (305-311) in the East, and the emperor Maximian Hercules (284-305) in the West. Renouncing paganism, the Emperor did not let his capital remain in ancient Rome, the former center of the pagan realm. 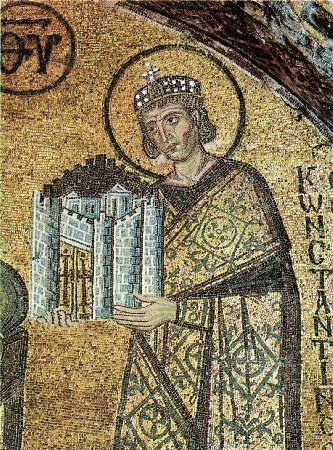 He transferred his capital to the East, to the city of Byzantium, which was renamed Constantinople, the city of Constantine (May 11). Constantine was deeply convinced that only Christianity could unify the immense Roman Empire with its diverse peoples. He supported the Church in every way. He recalled Christian confessors from banishment, he built churches, and he showed concern for the clergy. The peaceful state of the Christian Church was disturbed by quarrels, dissensions and heresies which had appeared within the Church. Already at the beginning of Saint Constantine’s reign the heresies of the Donatists and the Novatians had arisen in the West. They demanded a second baptism for those who lapsed during the persecutions against Christians. These heresies, repudiated by two local Church councils, were finally condemned at the Council of Milan in 316. Particularly ruinous for the Church was the rise of the Arian heresy in the East, which denied the Divine Nature of the Son of God, and taught that Jesus Christ was a mere creature. By order of the emperor, the First Ecumenical Council was convened in the city of Nicea in 325. 318 bishops attended this Council. Among its participants were confessor-bishops from the period of the persecutions and many other luminaries of the Church, among whom was Saint Nicholas of Myra in Lycia. (The account about the Council is found under May 29). The emperor was present at the sessions of the Council. The heresy of Arius was condemned and a Symbol of Faith (Creed) composed, in which was included the term “consubstantial with the Father,” confirming the truth of the divinity of Jesus Christ, Who assumed human nature for the redemption of all the human race. One might possibly be surprised by Saint Constantine’s grasp of theological issues during the discussions at the Council. The term “consubstantial” was included in the Symbol of Faith at his insistence. After the Council of Nicea, Saint Constantine continued with his active role in the welfare of the Church. He accepted holy Baptism on his deathbed, having prepared for it all his whole life. Saint Constantine died on the day of Pentecost in the year 337 and was buried in the church of the Holy Apostles, in a crypt he had prepared for himself. Having seen the figure of the Cross in the heavens, / and like Paul not having received his call from men, O Lord, / Your apostle among rulers, the Emperor Constantine, / has been set by Your hand as ruler over the Imperial City / that he preserved in peace for many years, / through the prayers of the Theotokos, O only lover of mankind. Today Constantine and his mother Helen / reveal the precious Cross, / the weapon of the faithful / against their enemies. / For our sakes, it has been shown to be a great sign, and fearsome in battle.